Movado makes nice watches. On the scale of Walmart special to “oh god what happened to my bank account,” its watches are priced firmly in the middle. They’re fashionable and can last for decades, but they also don’t cost the same as half a year’s rent. Movado is also known for design. It’s most famous watch—the Museum Watch—has been in the collection of New York’s Museum of Modern Art since 1960 as an icon to midcentury design. That’s a rare feat for a modern timepiece. So Movado building a smartwatch is important, because if anyone can figure out how to make these things look cool it’s this Swiss watchmaker. A smartwatch with some actual style. The new Movado Connect is a $650 Android Wear smartwatch. It’s got a microphone (if you feel the need to talk into your watch), NFC (if you feel the need to pay for stuff with Android Pay), and a gyroscope and accelerometer (if you feel the need to track your steps). But there’s no heart rate monitor in this thing, and it’s water-resistant, not waterproof. So don’t expect to take it for a swim. But despite being more than twice the price of an entry-level Apple Watch, and possessing half the features, the Movado Connect is still one of the slickest smartwatches you can buy right now, because this thing really does have style. While that’s largely due to Movado itself, it’s also because of Android Wear. Google’s wearable operating system is more concerned with looking good than of doing everything your phone does but on your wrist. Google’s bid at the wearable market has had some issues since launching in 2014. First it was because the watches were ugly and the software wasn’t much better. Than Google seemed to find itself in a pickle endemic to the wearables industry. Everyone rushed out to buy these devices, realized they weren’t magic, and then stopped buying them altogether. Last year was so bleak for smartwatches that I even declared they were dying. And earlier this year, according to the market research firm Strategy Analytics, Android Wear’s share of the smartwatch market actually fell to third place behind Apple and Samsung’s Tizen OS. Pictured left to right: the LG Watch Sport, Movado Connect, and Apple Watch Series 2. Admittedly Android Wear has dramatically improved since a major software update earlier this year. Battery life and speed are better, and the OS is just easier to use. Singleton also noted that watch sales tend to peak during the holiday season, which means any major sale improvements related to the Android Wear update won’t be apparent until much later this year. Until then, if Google wants to work against the bad hype, it needs a cool hook. So Android Wear is now the OS for fashion watches. This repositioning of Android Wear began last year when Google started working more extensively with watchmakers Fossil and Tag Heuer, and fashion brand Michael Kors (which works with Fossil to design all its smartwatches and accompanying software). Which brings us back to Movado, Android Wear’s latest partner and a watch brand with a lot of coveted cultural cache. As watch designs go, few are more iconic then the little sun in the 12 o’clock position on a Movado watch. It’s found on nearly every timepiece the company makes, from its cheapest watches, which retail for $395, to its priciest, which goes for nearly $3,000. It’s present on the new Movado Connect as well. That is one of the reasons the company apparently feels comfortable charging $650 for a watch that does a lot less than something like the Series 2 from Apple. The Apple Watch might be iconic amongst tech bloggers, but Movado’s iconography has a far broader reach. The watch has a single button, and two small microphones. And after wearing the watch around New York City for the last week I have to admit there’s a cool factor that I simply haven’t experienced with another smartwatch. People noticed my watch and then commented on it in a positive fashion! That never happens with smartwatches. Ever. Sure there were the early Apple Watch days where people would think the device was kind of neat—but for the most part, smartwatches are just regular watches with a fancy screen. They’re boring. The Movado Connect is not. It’s definitely large, with a much bigger than average 46.5mm case diameter. It’s heavy on my wrist and can feel unpleasantly hot in the summer. Going with a rubber bracelet that doesn’t breathe feels like a big misstep for an otherwise great looking watch. Usually a watch this large would look enormous on a smaller wrist, but this one never does. The gold case and lugs (the bit of the watch attached to the straps) grab the eye and give the watch a hyper-modern flare that verges on industrial. It’s just enough pop to be pleasantly eye-catching regardless of gender. The charging points are recessed so they never dig into your wrist. People see this watch, with the contrast of black and gold, and they tell me it’s gorgeous. Yet the real star of the show is the watch’s face, which mimics a movement impossible on most wristwatches. In traditional watches, the movement is the center “engine” of the timepiece. There have traditionally been two kinds: mechanical and quartz. Mechanical watches have a very smooth movement, with the hour, minute, and second hands sweeping across the watch face. Quartz movements seem to tick across the watch face every second. Movado’s included multiple watch faces for the Movado Connect, including ones that mimic its popular Museum Watch. Yet according to the company, the Cyclox watch face (pictured below) is the one Movado has been wanting to do since the 1940s, but has never been able to due to the sheer limitations of watch mechanisms. At the center of the watch face is the hour, represented by a number. The minute, fashioned like the iconic sun element found in other Movado watches, sweeps gently around the outer edge of the watch face, and the second is a bar that chases after it. 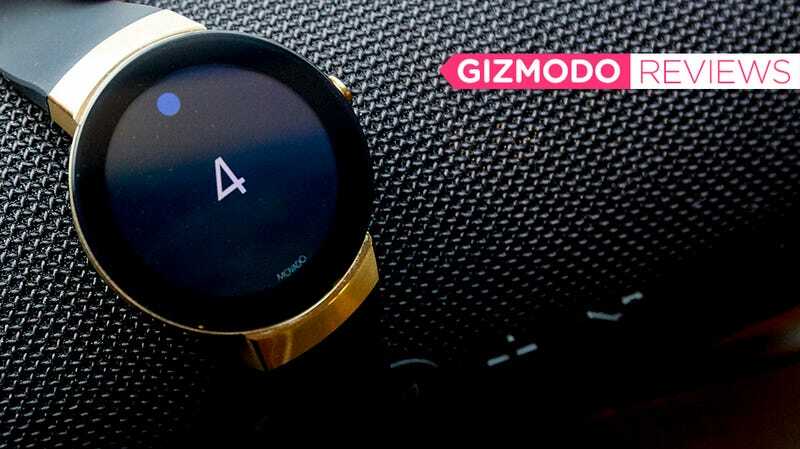 Up close with the coolest feature of this very pricey smartwatch. It takes a few moments to get accustomed to reading the time this way. It feels radically different from reading time on a mechanical or quart timepiece or any other digital or smart one. Yet once you get used to it every other way of reading time on a watch feels kind of staid and lame. This is something new and, crucially, it’s taking advantage of features in a smartwatch that allow it to do things no traditional watch has been able to do. Movado has wanted to tell time this way since the 40s and now, thanks to Android Wear, it can! That’s how you make a smartwatch interesting. Everyone else, including the much more successful Apple, is obsessed with shrinking a phone down onto your wrist, but severely hampering its functionality at the same time. Movado is instead thinking differently. It might be such a small and simple experiment, but this Cyclox watch face is a great example of what you can do with a smartwatch when you stop thinking of it like a tiny phone and start thinking of it as a hyper-productive timepiece. The only downside to this gorgeous beast? At $650 this is firmly a luxury timepiece. If bold post-modern style is important to you, the Movado Connect is perfect. Otherwise cross your fingers that other watch makers take note. When it’s on your wrist 20 hours a day, style matters. It is $650. Which means it makes no sense if you’re comparing it, feature-wise, to a $300 Apple Watch. It’s got more style than just about any smartwatch available. The Cyclox watcface lets the Movado Connect tell time in a way impossible for dumb watches. It’s water-resistant, and features Android Wear 2.2, which means it actually works on iOS. It lasts more than 20 hours on a charge.